Morocco is a magical, mystical and romantic country. Snake charmers, dessert camel rides, chaotic Medina’s and more, all make Morocco such a unique country to experience through photograph. While traveling through southwestern Morocco on a recent Photo Adventure, I came across one of the most unusual sights. Goats in a tree. How could this be? These beautiful goats stood so confident and so peaceful, just taking in the view. How did they get there? Why are they up in a tree? And no, this is not a trick or Photoshop. Nicknamed after the trees they climb, Argan goats climb these trees in search of food. The fruit from the Argan trees are some of their favorite food. These goats can climb trees as high as 30 feet. Over the centuries, these hoofed creatures have mastered the skill of climbing on branches. It’s quite acrobatic and a wonder to behold. But the story gets even better. 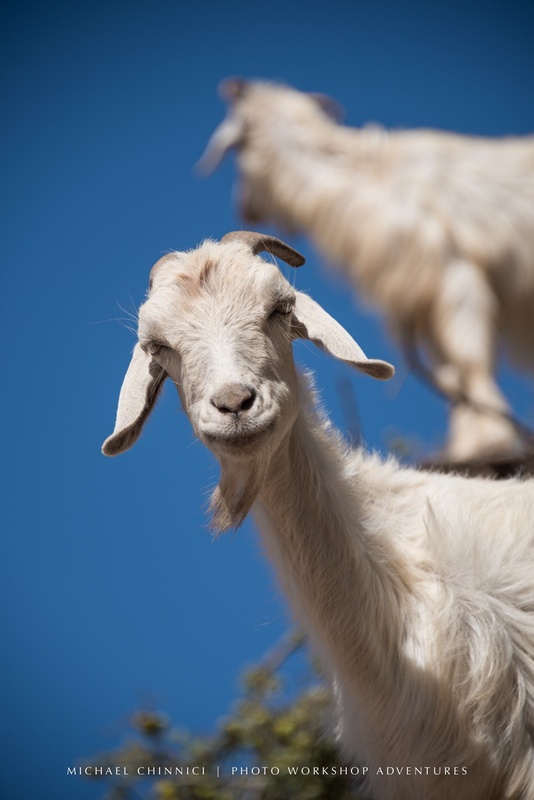 The droppings of the goats contain the kernels from the seeds of the Argan fruit, which are, strangely enough, used by locals to press and grind into oil. The small, firm argan fruit has a thick peel and pulp surrounding an almond-shaped nut. Traditionally, members of the indigenous Berber tribes would gather nuts from the goat droppings, crack them open with stones, then roast and grind the seeds inside. The argan oil extracted from this process is high in essential fatty acids and vitamin E, and has long been used locally as a skin treatment and cooking ingredient. If my Aunt weren’t a goat farmer, Im nit sure I would have found this out about them OR Argan Nuts! I love the stuff for all kinds of beauty treatments! It’s been grand discovering this! i am from indonesia,,,,,,i like this perfoment video because it has a beautiful video quality end amazing…. I thought they were up there to escape from something trying to Eat them…….Learn something new everyday….Really Cool !!! Nature can always surprise us! Have you not filmed them actually climbing the trees? Added to my bucket list! Do you have video of them climbing? Just returned from there. If the goats are just standing there then they have been posed there by the herder. They only climb to eat the leaves. If not eating then they just stand there waiting for tourists to pay to take their picture. We saw this exact same tree w goats just hanging around. Our driver took us a couple of miles down the road and there the goats were climbing in and out of the trees – eating! Can they get down ok? Very interesting very cool! Nature is amazing. 🙂 Thanks for sharing. The writer of the story is a completely naive persson. what he does not seem to realise is that the poor goats are put there by their owner for tourists to see and photograph and pay money in return. the goat are left perched on the trees all day long without food or water. what you are actually doing is taking part in the maltreatement of poor animals. we were in Morrocan a number of years ago visiting our Morooracn friends. They to us that very often these goats are not up in the trees of their own free will. They are tired up in the trees for the tourist in hopes of getting money for the folks who are with them on the ground. A wonderful sight if the goats climbed the trees themselves, not so great if they are tired up in the tree. Never thought I would ever see such a site! Amazing!! This is so difficult to believe that hoofed animals can climb trees. My wife refuses to believe it saying that the picture is a gimmick. I wish you had a video showing these goats actually climbing the trees. Thank you. It’s amazing. They’re probably good at escaping wolves. Yes , so amazing … that tree is their favourite food ..
No it is not. They only eat as supplement to grasses. If this was only diet they would be very thin. Morrocco had a lot of rain this year so the herds are fat and reproducing. And the herders are happy! Argon Oil from Morocco is good for your skin and hair. Guess I’ll never see this for real, but I do use Argan oil on my skin and my hair. Thank you for sharing this. does not decide to take a PEE on me. Goats have always had the ability to climb. It is their God given trait for survival. They can climb the highest and unattainable crags in the mountain regions. They can access their food and perch in places of safety. 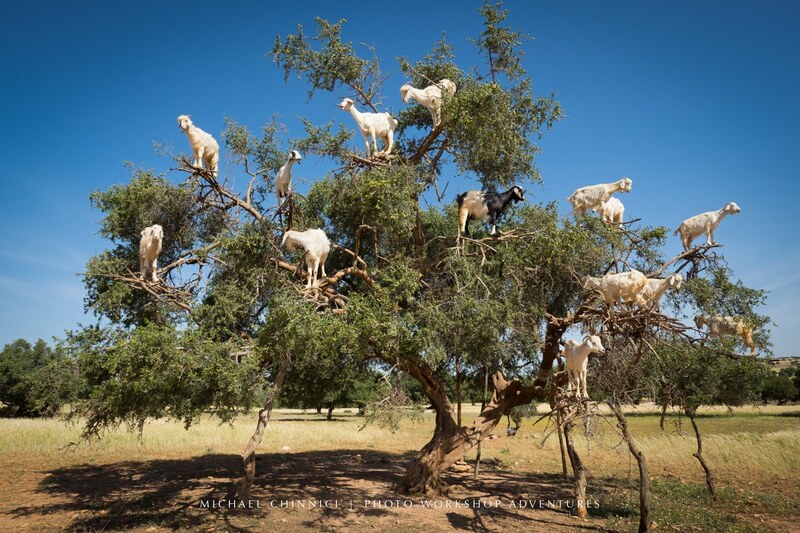 These goats are not tree climbing goats. They are just put on the trees on the road side as decoration and to attract tourists. 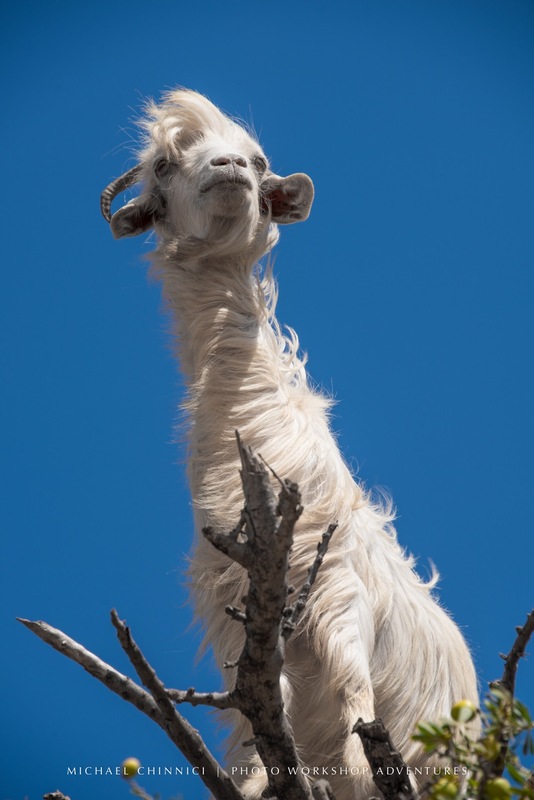 However, tree climbing goats do exist in Morocco and they are usually small in size and very quick and restless. I am going to morrocco in January, wanted to go for a long time and now I’m finally doing it! Hope I see these amazing goats! Go to Agadir that’s where famous argan oil is produced. Do the Berbers use the goats beautiful coat to weave rugs or other fabric? I’ve been to the fascinating country of Morrocco, but not this area. Thanks for these wonderful pictures. I went to Morrocco and they are trained by people to be there hours to be seen by silly tourits who wants to take pictures. Who do you thinks does all that support for the branches? I completely disagree in using anymals for shows. I hate the bull fights in Spain and circus where they use animals. 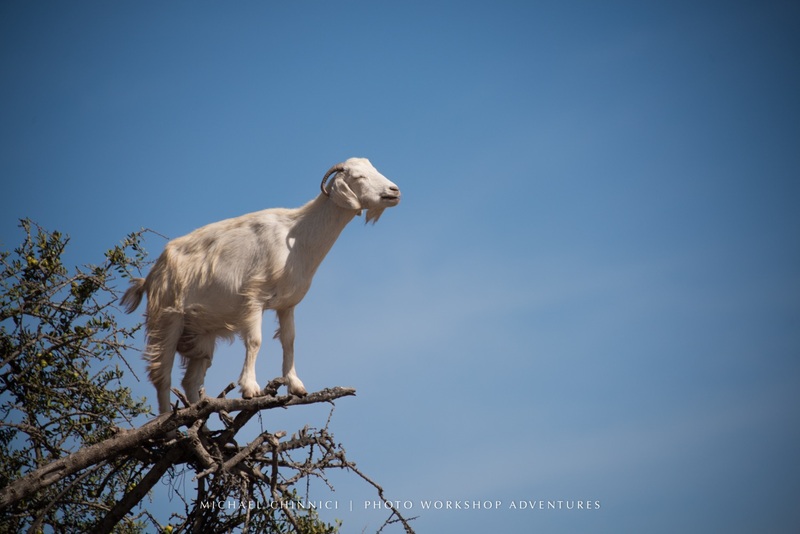 Anyone believe that it is the goats nature to all climb in one tree (with so many more trees around) and stand still at the very end of a branch? We saw the owners pulling them down after a day of gathering money for a silly picture. And now Argan oil seems to be in half the skin lotions and cosmetics around…I use one of the bath/shower oils every day and always wondered where it came from…is the oil better after it’s traveled through the goat? Just curious. I certainly don’t know if the goat’s gut adds to the oil. But my guess is that separating the seeds from dried goat dung on the ground is much more efficient that trying to harvest the fresh fruit. Thank you for a wonderful article. The goats look so at home in the trees, truly amazing. Again thanks for sharing these delightful creatures. Wow! Amazing! What a great photo and informative article. Thanks. (This is a “must share” in my book.) I will include the link to keep this glory going. What a wonderful article. Thanks for sharing. What city was this near? I visited Morocco 4 times and was married there. I stayed in Khemisset and a farm outside of Tiflet and Khemisset. Great photos!! Did you go to Rabat because I’m due to travel there soon on my own? Also, did you marry a Moroccan guy out there? Wow that is the most interesting and mysterious sight I’ve ever seen!! how do they get down safely? The climb down, just as the climb up. It’s amazing! Does the half and half always organize in the middle?.so peaceful.THANK YOU! That is one tree I would not take refuge under ..!!! I absolutely love it. Great job to all that had any part in this adventure. A photographer friend of mine Tiffany Briley was on the phone with the people that shot the video! Small world and yes, I leave as a friend! Nice saying! Welcome in our country “morocco” anytime..